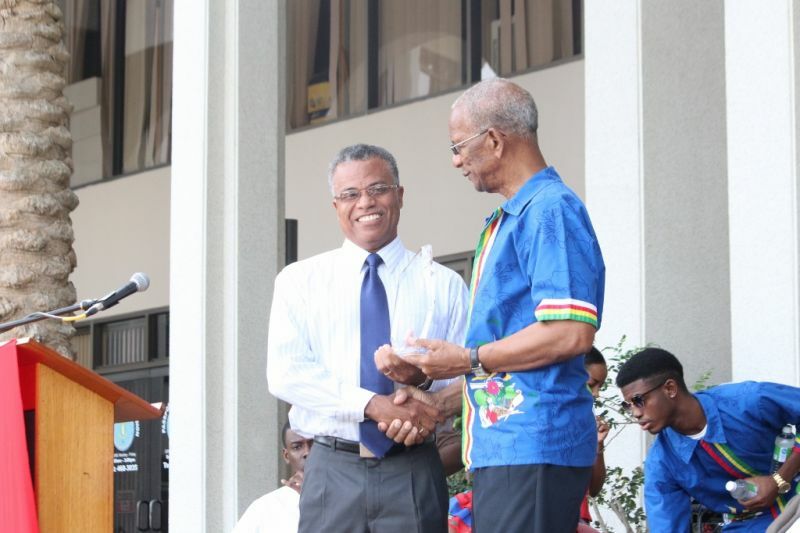 ROAD TOWN, Tortola, VI - Former Premier, former Leader of the Opposition, former Representative of the Ninth District and former Chairman of the Virgin Islands Party (VIP) Ralph T. O'Neal OBE was one of four stalwarts of the Virgin Islands honoured yesterday June 29, 2015 for their contribution to the territory at the Territory Day celebrations. 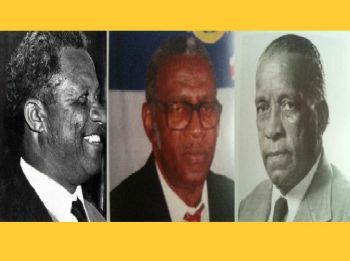 In addition to O’Neal, those honoured were late legislator Hubert Robinson O’Neal, late former Chief Minister Willard Wheatley and late former legislator Terrance B. Lettsome. 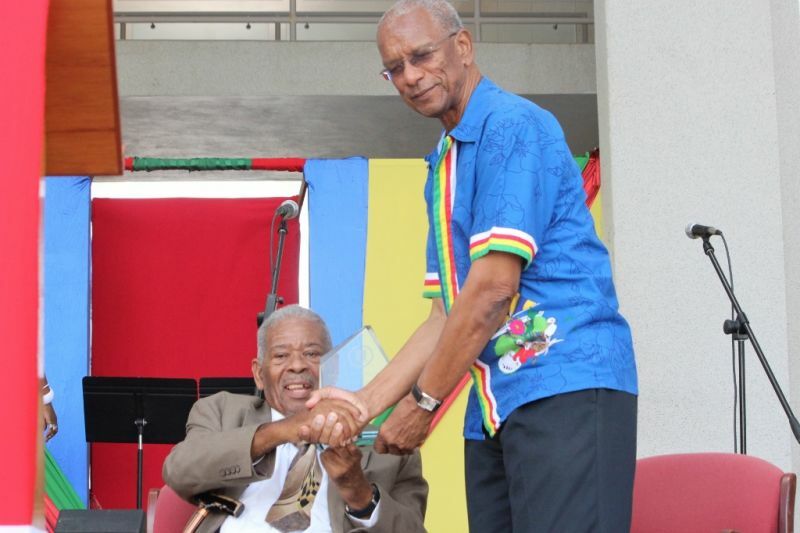 In his acceptance speech, O'Neal, the only honouree still alive, said he dedicated himself to the cause of his people and served them in the House of Assembly and spoke of his tendency not to engage in fights there. 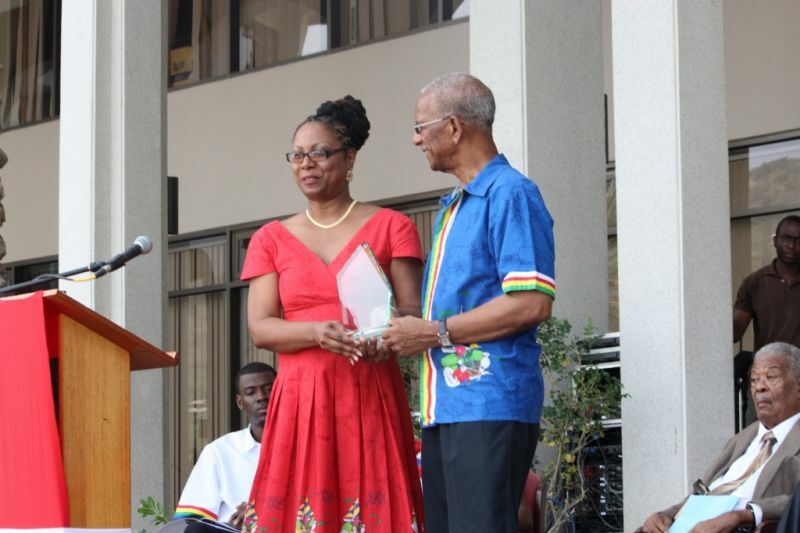 “First of all I want to thank the Government for this memento that they gave me. I want to thank them for their hospitality and I wish them well in the future,” he said. “As you know I retired from the legislative council and the National Assembly and as you know it takes a little time to get me settled into my next job which is doing my own work I hope,” he said. “I did not go to the Council to argue or fight with any member. I accepted any member that was selected by the people and I worked with them up to the last day I attended the Council. I have enjoyed a nice relationship and sometimes I think of past matters,” he said. He said he tried to be a man of peace. "…I don’t have time to be quarrelling,” he said. “I look forward to the people and what they want to get done,” he said, noting that he had some difficult times. “I want to wish my ex-comrades well and that they carry on their duty,” he said. He called for persons to treat Territory Day with the respect and reverence that the United States gives to its Fourth of July celebrations. “I hope that we will continue to celebrate Territory Day…you notice that in the United States the Fourth of July is a big thing in their country. Well we must keep the celebration going because it means a lot for us. It means that we are almost able to govern ourselves. 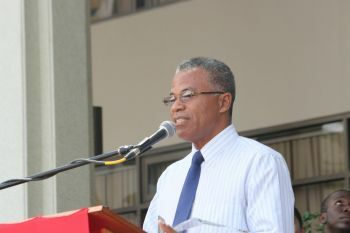 We must continue to keep it going and be steadfast and looking after our people,” he said. 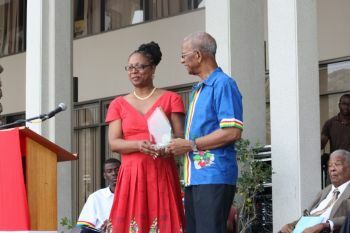 Daughter of honouree Terrance B. Lettsome Brenda Lettsome-Tye thanked the Government for the honour bestowed on her father and said he lived to serve his people. “He was never too busy, it was never too early,” she said during her acceptance speech on his behalf. “Some of my earliest memories are persons coming to the house even before I got out of bed and no matter what he was doing he dropped it and went and found out what his people needed and every evening he would be found at the Stickett finding out what happened that day and what everyone needed at that time,” she recalled. Accepting the honour on behalf of his late father, Dr the Honourable Hubert O’Neal (R9) said his late father was probably the most beloved on Virgin Gorda and of the whole Virgin Islands as in the early days he was a seaman. “…he was truly a statesman. He was charismatic and beloved by the people. 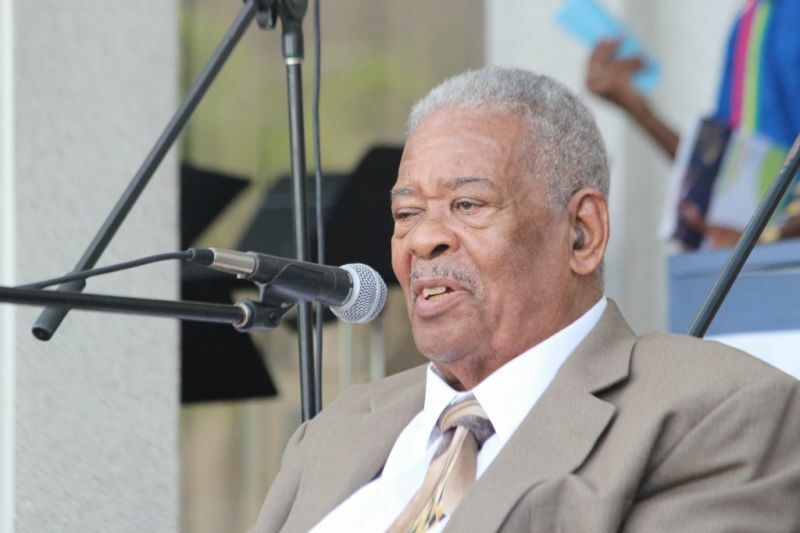 He was a most generous man,” Dr O’Neal said. 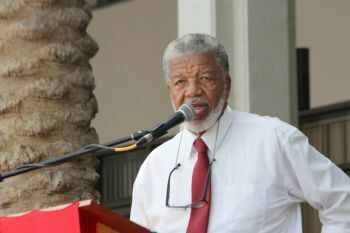 He spoke of his father of being a one man backbencher and he used that position and often ‘blackmailed’ then Chief Minister H. Lavity Stoutt to get what he wanted for Virgin Gorda and that is why he said so much was achieved in the three short years he represented the then District Seven of Virgin Gorda and Anegada. 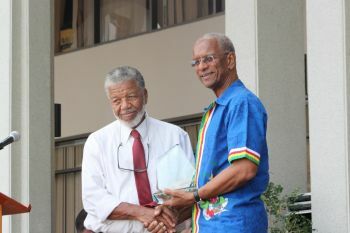 Popular radio talk show host Douglas Wheatley, son of the late former Chief Minister Willard Wheatley, said his father served as Chief Minister in the turbulent seventies. 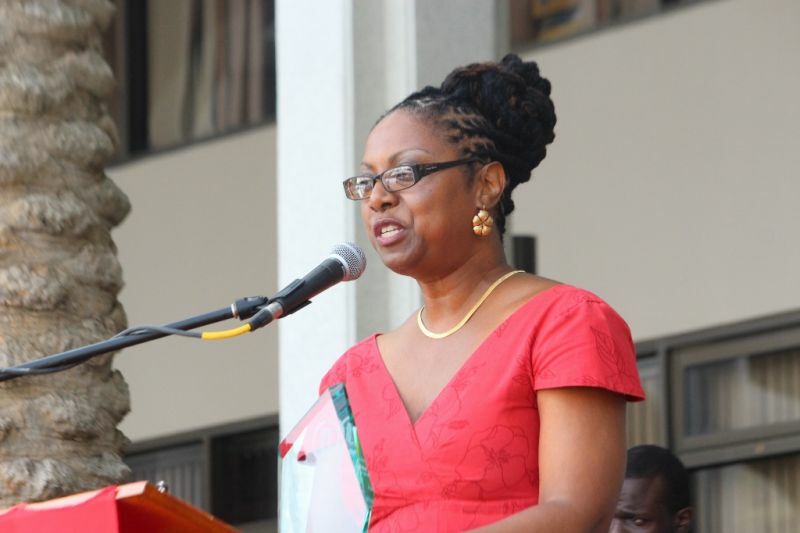 “If you think the present day legislators have difficulty you should go back to the seventies. At one point he had a majority of one,” said Wheatley. “On behalf of the family I want to thank the Government for honouring him,” he said, noting that the family is planning activities to mark the 100th birth anniversary of Willard Wheatley on July 16, 2015. Not to fight, not to lead, not to help your home, your own. What the hell we@@r@E in the house doing?. You gave good history lecturers in the house. thanks for that. I learnt a lot from you--This generation, we get things by fighting for it. New generation if you learn to be patient may be you would learn a whole lot. If you think the world was made by human hands in one day go ahead. Father we need understa1nding for our children to cherish the legacy of our 1qqqqleaders, who fought to make a better life for all of us. The whole damn bunch of this selection party needs to rot in hell. It's overbearing now how these hypocritical bastards show their respect for the man that made this country what it is today. We boast about financial services, we boast about tourism and yet we forget the man who made this possible. But guess what , virgin islanders are smart people and they know the truth so keep all your accolades and praises. Bob Marley once said " you can fool some people sometimes but you can't fool all the people all time" RIP Cyril B Romney " the uncrowded hero"
So according to you, CB was the one responsible for BVI's success in Tourism and Financial Services? That is simply not true and you can't fool anyone that it is. By the way, the IBC act was started during the 1975 - 1979 term where Willard Wheatley was chief minister. And Lavity was chief from 1979 - 1983. It just happened that CB was chief minister when it was passed in 1984. And how did CB become chief anyway over Willard in 1983? The only thing I find outstanding about CB was that he was a great opportunist although that can be a good thing sometimes. Yes, O'neal went to the house to do nothing but sit down and nap! You wrong the man have some thing that you and I don't have sleeping is a joke he only peeping but he can tell you everything that was said and his eyes was closed.